The concept of eating out was not very famous back in the early days. It was in the mid-eighteenth and nineteenth century that the concept of eating at inns and taverns were practiced among locals who frequently travel and had no access to a kitchen. Normally, these travelers would eat family style of whatever the owner of the place prepared. As hospitality customs evolved, the serving of food using menu cards were brought into the picture. Today, every cafe and restaurant has fast food brochures and menu lists for their dishes to delight their customers palate. 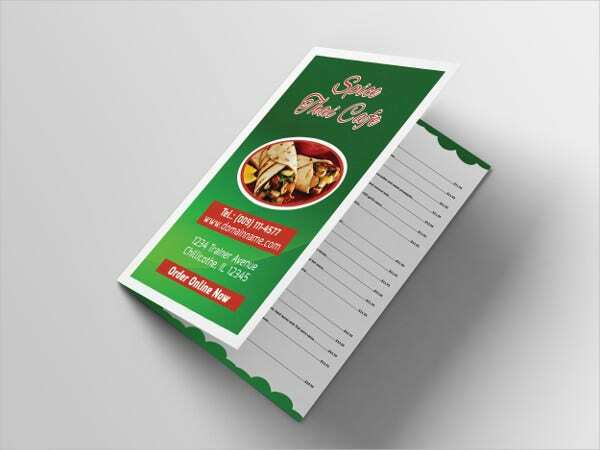 Whether you are in the business of bakeries, fast food chains, restaurants, or cafes, you will need a food menu to give more information to customers of the food choices you offer. 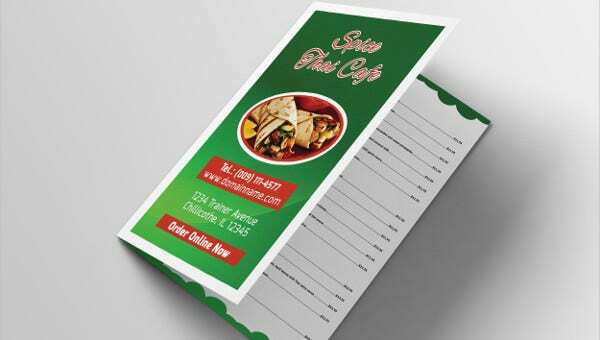 You can select from our list of food brochures for a specific function and design that you want to have for your customers. Our brochure templates have unique and clean layouts that will make it easier fr you to customize. 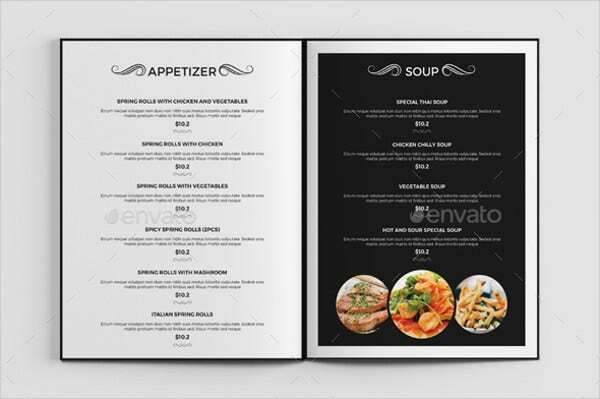 Food Menu Brochure. 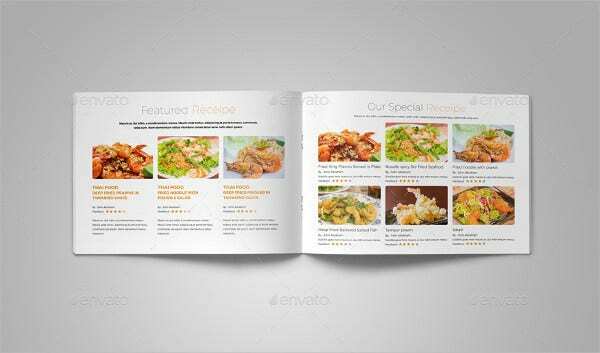 This classic food menu brochure is perfect for small to large restaurants who want to give their customers more information about their dishes like the kind of sauce used and other food mixed on the dish. Food tri-fold Brochure. The tri-fold brochure is perfect for describing different meals and promos that a food chain offers. You can also add budget or combo meals here. Fast Food Brochure. 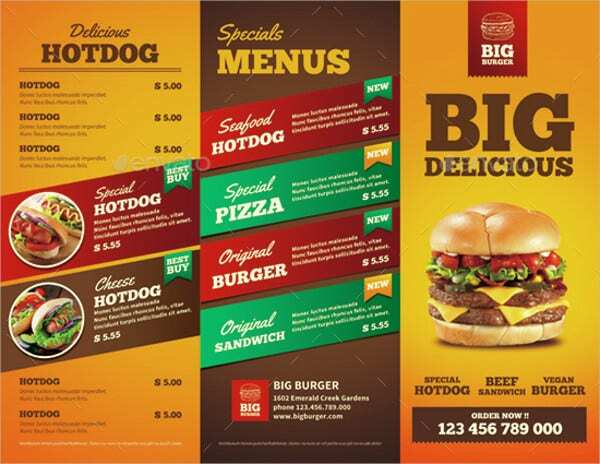 Want an attractive bright colored fast food brochure to feature your famous burgers? 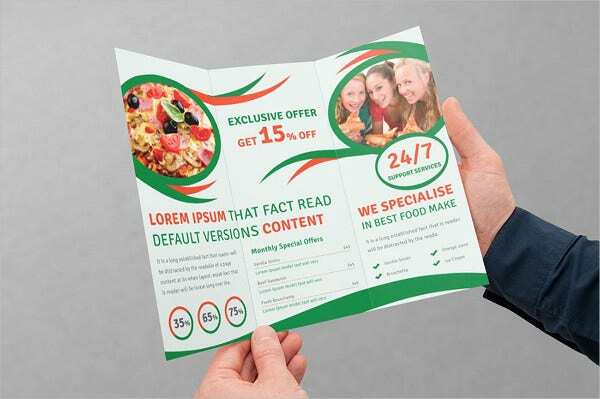 Get this fast food brochure with a tri-fold cut. Healthy Food Brochure. Needing organic food brochures for your health store? 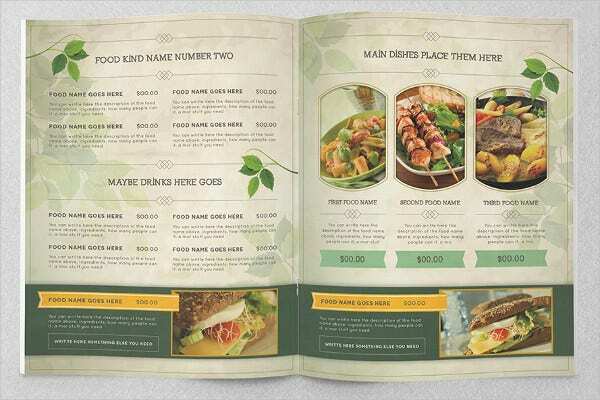 This food brochure design has a light plant background to showcase your organic food dishes. Food Recipe Brochure. Inspire grocery shoppers to create new step-by-step meal plans with this recipe brochure that can hold up to 10 recipes or more. 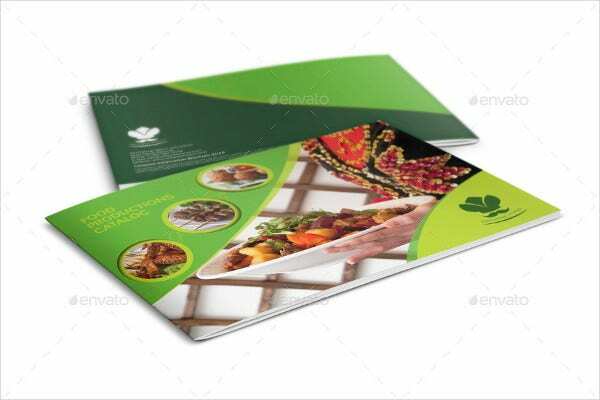 Restaurant Food Brochure. 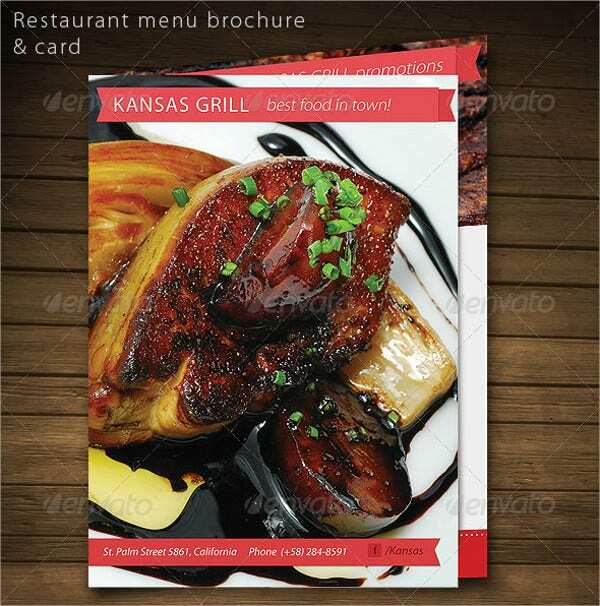 Feature your best-selling dish with the restaurant food brochure. You can also add a beautiful cover using this design. Food Product Brochure. Showcasing food items on sale? Inspire shoppers to get your limited edition food sale with our food product brochure in green background. Food and Drink Brochure. Looking for restaurant brochures that will feature your appetizers, desserts, and drinks? This small brochure is sure to place more orders on your food choices. Start with well-lighted food shots. Photos of dishes or meals will be the first thing that people look at. Taking shots of food would need ample lighting, so the food would look enticing and not dry. Use clear fonts. Use clear font styles when placing text on your menu. Please avoid using scripted and thin fonts as much as possible. The minimum font size should be at least 12 for your menu to be readable. Use light font colors against a dark background and dark font colors against a light background. Another factor to consider in having a readable menu, is to use this rule. Scratch out food items not available in your list. The number 1 complaint of customers is when a food item goes out of stock. Some food items are seasonal, so it’s a good idea not to include them in the photo. With these tips in mind, you can easily D.I.Y. our chosen food brochure template.